Is your wholesale insurance provider offering white-glove service? We live in a service-oriented society. From our smartphone providers to our office technology, we expect—even demand—service. And the companies who provide that service stand to profit in the form of repeat customers, word-of-mouth referrals, and up-sells. It works like this: Provide stellar service, earn trust, recommend additional products, write more sales. 1. How much time are you spending delivering that service? 2. Is your wholesale insurance broker providing that same level of service to you? If you’re purchasing your mandatory temporary disability benefits (TDB) insurance in the State of New Jersey or DBL coverage in New York through the respective states, the answer is probably no. Insurance brokers are always free to purchase mandatory TDB and DBL insurance coverage through the state exchange. The rates will be comparable to those they will find through any broker on comparable, minimum benefits policies. But we all know the level of service we can expect from the government. Think about your state’s Department of Motor Vehicles. Any state-run agency. The U.S. Postal Service of the past. Take note, the USPS was forced to step up its game or lose to competitors UPS and FedEx, and now even Amazon is getting into the shipping game to deliver the level of service the world’s largest e-commerce retailer deems acceptable. Once again, it’s about pricing and service. But if you’ve ever been to DMV during peak hours, even for a simple transaction, you understand that the U.S. government, typically, does not provide superior levels of service. The same is true for each state’s Department of Labor, which acts as the broker for mandatory TDB and DBL coverage in New Jersey and New York, respectively. So what do you do if you want better service? You look to the private sector for help. If you’ve ever purchased a new car from a dealer and had the dealer manage all the DMV paperwork, you understand the beauty of service. All you had to do was sign a few papers in order to drive away in a new car with new plates and your registration sticker firmly attached to your windshield. Now let’s take it a step farther. Maybe that car is a Lamborghini or a Tesla. Now you don’t even have to get a ride to the dealership to pick up your car—they will deliver it straight to your door. It turns out, today, this service is even available on brand-new Hondas and other mid-level automobiles, if you know where to shop. Dealers recognize the value of service to create repeat customers. Similarly, when you want ultra-luxury service at mid-level prices in the insurance industry, you have to know where to shop. For more than 40 years, The DBL Center has been providing five-star, white-glove service to our insurance brokers. We love the analogy of a concierge at a boutique, luxury hotel, which you’ll notice from the moment you visit our website to the second you call us. 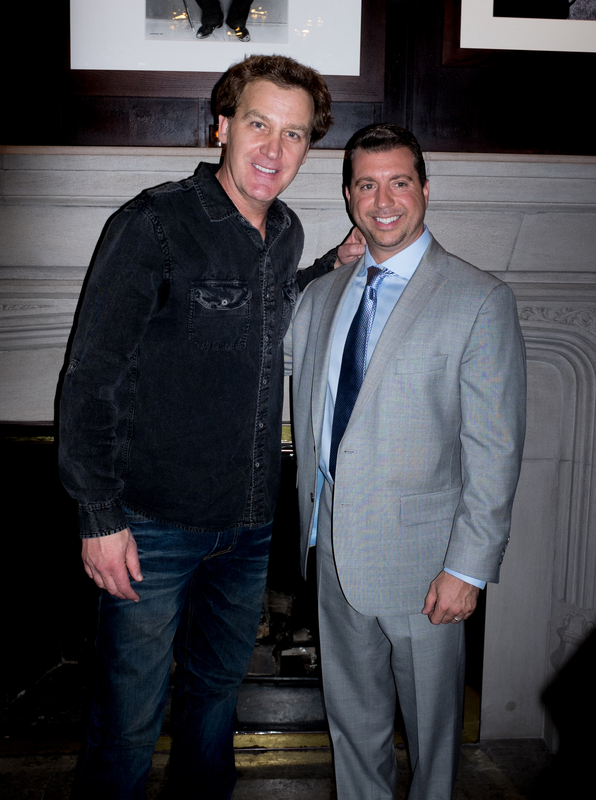 The DBL Center partner Michael Cohen and comedian Jim Florentine, frequent guest on the Howard Stern show. The DBL Center acts as your back-office support staff to service all your client’s accounts, so you can focus on expanding your book of business. You know the value of service, but you don’t have to spend every hour striving to provide the best in your area—The DBL Center does that for you. You should expect this level of service, because your customers do. We don’t limit our service to insurance products. If you need a something special to thank a specific client or entice a new prospect, we can use our vast connections across the New York Tri-State area to deliver. We recently signed an arrangement with Steiner Sports to book comedy acts and sports stars for special events, corporate outings, parties, and more. And that’s just the start. Whether it’s training for your employees; fast service; quick, binding rate quotes; technology that makes it faster and easier for you to do business, or even something extra, The DBL Center delivers.